Welcome to my site. I am on a path to financial independence and want to guide the way for you as well. Follow along as I, a 27 yr old, take a regular salary and simple investing strategy to an early retirement. If you read last month's post, you saw I was able to keep my expenses very low at just over $1200. Well this month didn’t turn out so hot. This month is a perfect example of why you need a lot of data when projecting your future expenses. You’d never remember to factor in certain type auto repairs or the fact that you’d fall in love with an over engineered cooler. Ok maybe that last part is just me but we all have our weaknesses. The main concern most people give me on my quest to early retirement is how I shouldn’t be sacrificing my youth and living for the future. Have fun now! If you follow along with my months at all, you know that’s a silly concern. Let this month be the latest piece of evidence. So what fun things happened this month? Saw David Blaine do some insane live magic. Big shout out to Vet-Tix for the free tickets. Enjoyed a 007 party in Colorado. It was my buddies 50th birthday and he offered to buy half the ticket. I picked up the other half for like $250 and borrowed a tux from a local “Buy Nothing” Facebook page. I finished out the costume with a $1 squirt gun and a quick shot of gold spray paint. All the expenses for this trip were captured in previous months. My dad heard the offer my friend made me and decided to do the same. He paid half my plane ticket to come out to Arizona with him for a work conference. We had some free time as well and hit up the Grand Canyon. I extended the trip a little with some free Hilton points. That’s just one month and I can promise next month will be just as jam packed. You don’t have to sacrifice happiness to reach financial independence. If you did, I wouldn’t support the journey. Just be creative and always look for maximizations. Ah no fun ups or downs here. Just my normal income. I think next month will show a slight increase after my new retirement plan adjustments finally start showing up. I’m not going to lie. I’m pretty disappointed with this month even if I did still save 70%. With the house fire situation and my meals being capped, my expenses should be trending down but instead it went up almost $1,000 this month. I think it’ll make more sense as you dive into the Miscellaneous category and see that this month just had a lot of weird stuff that you probably only encounter once a decade. Have I mentioned my sweet cooler yet? I actually did eat out but don’t have to put anything in this category because of how insurance works when you are displaced. If you want to know more about that whole house fire situation, click this awesome blue text. So I don’t really know how much I spent on groceries but I know $60 is all I’ll have to cover. This is again thanks to renter’s insurance. See my average expense for groceries over the last few years was $60 so I pay that much and USAA picks up the rest. Seriously guys, go get renter’s insurance. Bills for this month include Rent ($775), Unlimited Data Cell Phone ($85), Spotify ($5), Car Insurance ($49.32). I now have coverage on both my Ford Fusion and F-150 but went with liability on both instead of just full coverage on the fusion. It actually lowered my bill overall. I still owed $12 on my old internet bill but this is the last bit of that as long as I’m living in the hotel. I continue to fully get my value out of MoviePass even though it’s getting harder and harder to love. My big travel expense this month was buying half a plane ticket to Arizona. My dad picked up the other half because he was out there at a conference by himself. I couldn’t pass down such a nice deal and escape from my hotel to stay in an entirely different hotel. The pool was insane there. Like a real beach in the middle of the property. I used 19k points to book a hotel out there a day before he arrived for the conference but don’t worry, I still have 840k left. On one hand I’m ashamed of myself. $965 on random stuff in one month?! On the other hand, I still saved 70% even though I had some super random expenses. This just goes to show it’s ok to take care of some things or splurge from time to time if you’re meeting your goals. There were four main purchases that made up this big bill. First, I decided to get my Ford Fusion touched up so that I can sell it. I’m now reconsidering and contemplating renting out my car through a service like Turo. It’s actually just been sitting for a couple months now and I’ve got no excuse for missing out on the cash flow. Next is the cooler to end all coolers. I completely understand that most people would never spend $180 on a cooler, especially one not named Yeti. But this thing is so cool. It’s got led lights inside that come on when you open it. A table top that goes onto the handles. Tie downs for carrying extra things on top. Big wheels and an oversized handle. Integrated bottle opener…on both sides. And a tray insert for keeping somethings dry up at the top. Then my carry on of six years finally died. Two wheels had been destroyed for a while but the handle breaking was the last straw. 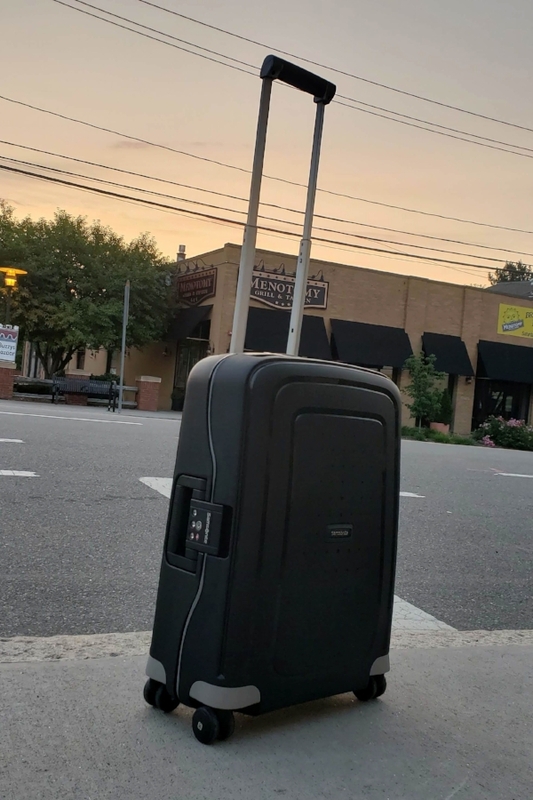 I got an awesome compact Samsonite for $99. My favorite feature is that it has no zipper. Just three latches so you can really jam stuff in there. Round that off with things like packing cubes, haircut, tumblers, toiletries, Leslie’s bday presents, and $125 towards my deductible for the house fire and you have a super inflated random expense category this month. A mix of being out of town, riding my bike to work a lot of days and rewards churning had me spending very little on gas this month considering I’m driving a massive gas guzzling machine. These months always crack me up. I feel down on myself for spending so much money on random things and yet my Net Worth Increase is one of my best. I know that we’re having some great times right now, and I know there will be some tough days ahead, but the snowball is real and you could have one too. I started with $38k when I started tracking my money in April of 2015. I made basically nothing through investments for the first year. Then year two started showing real progress and year three felt like a rocket. Be patient, be calm, be consistent, but don’t quit. I’d love to hear what your upcoming goals are so we can celly together! Keep saving and trust the process. Thanks for reading. Sep 13 Should You Go to CampFI? Get updates when fresh content is published. You'll never get junkmail from us! Thank you! See you in retirement soon!